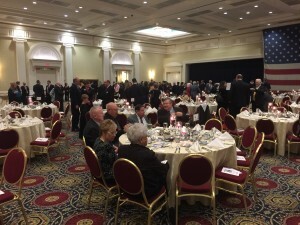 This past Saturday evening I was lucky enough to attend another Kent County GOP, Lincoln Day Dinner, in Dover. Now I will save for another time, why Lincoln is not this Republican’s favorite president, after all, as a Republican I am supposed to hold him in high regard. I will say, the Kent County GOP Committee, knows how to put on one hell of an event. Thank you to Hank McCann, County Chair, and to Cathy Murray and Bonnie McCann and the rest of the Dinner Committee for all of their hard work. I missed the Lincoln Day dinner in Sussex this year due to it being my 33rd wedding anniversary weekend, maybe next year. And while that event is not as large, it is a much more intimate occasion. The room was packed, after all it is an election year. The photo above was taken early as people were still coming in. Plenty of elected officials and candidates, as well as good Republicans. This was a fund-raiser and I am sure funds were raised, the food was good, the company was pleasant. There was plenty of speech making, and awards handed out. And then came the Key Note Speaker, and I have to admit, this was something I was waiting for. One might expect at an election year fund-raiser for Lincoln Day, you would have a speaker who talked about building the party, or about working to get Republicans elected, or at the very least some cliché hate Obama speech. Nope! What we were treated to, was a lecture about the need to call a Convention of States to propose amendments to the U.S. Constitution. What you say? What could we possibly need to amend the Constitution for? Well that is what the speaker, Michael Farris, lectured us on. It seems that Mr. Farris along with fellow traveler, State Senator Dave Lawson, thinks we need to amend the Constitution to mandate a balanced national budget, you know like the lie we tell ourselves here in Delaware. Also to limit the jurisdiction of the Federal Government, and term limits. Let me take these three things first. So, it seems that Sen. Lawson thinks it would be a good idea to impose the same fraud on the nation which is imposed on the citizens of Delaware when talking about a balanced budget. 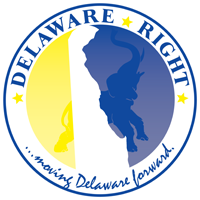 Delaware’s constitutionally mandated balanced budget, is only balanced for about thirty seconds, since it is balanced on projections not actual revenue. Secondly, the U.S. Constitution already has checks and balances written into it, that allow the separate branches of government to rein in each other. Creating new amendments will do nothing if the elected officials refuse to exercise those checks and balances. But Sen. Lawson is a former police officer, and sometimes former officers tend to believe, all we need are more laws to make things work. And finally, term limits. WOW! I can’t believe how many times this old saw comes up, and always from the party out of power. This is what whiners always suggest. We can’t win elections, so we need term limits, because that will give us the chance to win. WE HAVE TERM LIMITS, THEY ARE CALLED ELECTIONS!!!!!!!!! 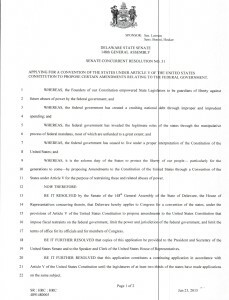 So, Sen. Lawson has a resolution he intends to bring to the floor of the Senate. Is this what Republicans should be focused on in this election cycle? Does Sen. Lawson understand the position he will be putting his fellow Republicans in by forcing them to vote on this. More importantly, does he not know how to count? This piece of tripe has about as much chance passing the Democrat controlled General Assembly, as Sen. Lawson does of pouring piss out of a boot with the recipe on the heel. But let us consider for a moment, this movement was actually able to get 2/3 of the states to call this convention. What then? Mr. Ferris spoke quite a bit about the opposition stating this could turn into a run away convention, where the entire Constitution could be lost. 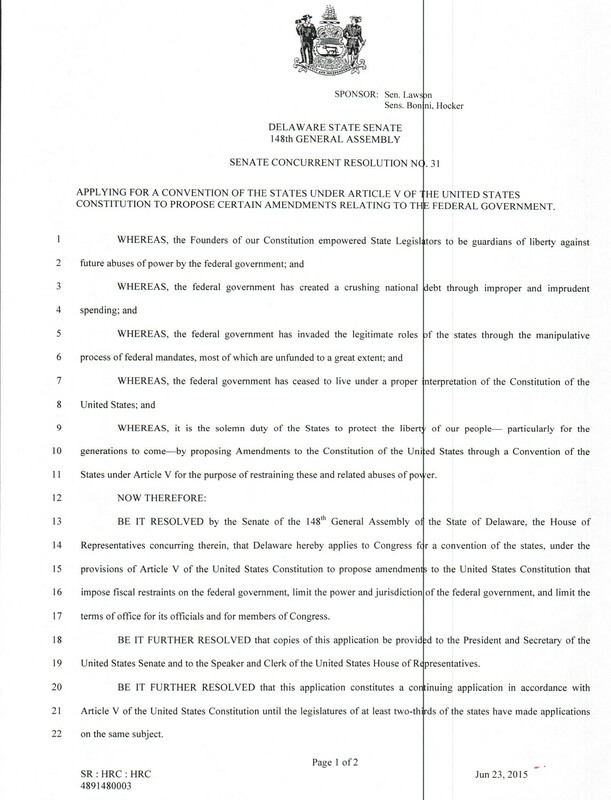 Mr. Ferris assured the audience this could not happen because there would be “RULE” going in which would limit what could be proposed and what amendments could be brought to the convention. Again, WOW!!!! Has this guy never heard of a tactic known as suspending the rules? Happens all the time. Once you call this convention there is a real possibility of losing what is best about our nation, and for what? Three meaningless proposed amendments? Mr. Ferris also spoke a lot about a run away SCOTUS, again a favorite battle cry for the far right fringe. It is not the Constitution that needs to be amended. It is not our elected officials that need term limits. It is our voters who need to inform themselves, in order to make better decisions on election day. If we the voters, do not exercise our right to vote in a manner worthy of that right, we have no one to blame but ourselves. I was setting across the table from a young attorney, (no not that young attorney) and he asked me what I thought we needed to “DO” to get Republicans elected. This was prior to the speaker, but his hand outs were on the table, I held them up and said, “this is why we can’t get Republicans elected, because of this type of pandering to the fringe, that allows the left to paint us all as fringe”. So really, it’s not what we need to “DO”, it’s what we need to “STOP” doing, to be able to get Republicans elected. 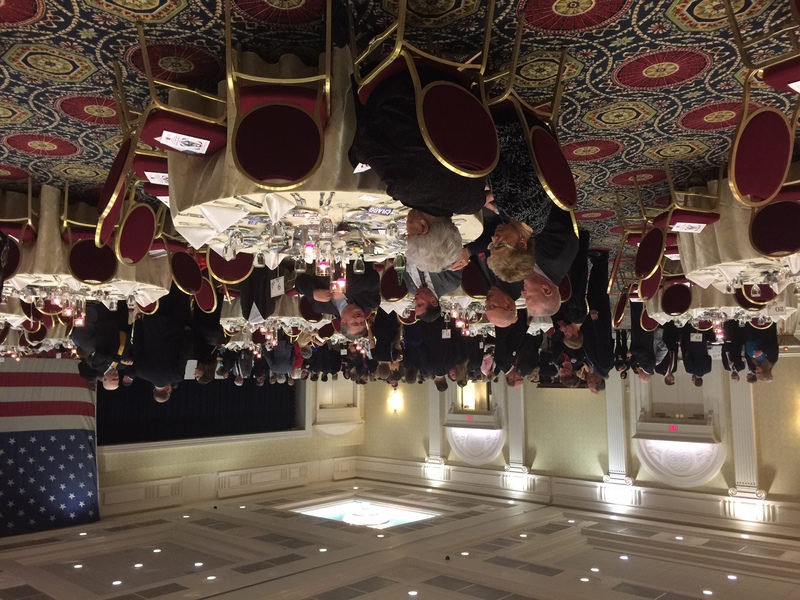 4 Comments on "Kent County Lincoln Day Dinner"
Isn’t it odd that Kent County is providing the gubernatorial candidate in Colin Bonini but didn’t ask him to be the speaker? This is just plain weird. the chances of a GOP candidate becoming the next governor is slim to none. Neither Colin Bonnini or Lacey Lafferty are worthy nor do they have a clue how to lead this state out of the trouble we are facing. Lafferty didn’t even work the room in her usual fashion, no surprise since most of the GOP district media pages pull down all her spam she posts. 105.9’s Jon Budler “interviewed” Laffery it was the SSDD message as empty as the space between her ears. Neither Colin Bonnini or Lacey Lafferty are worthy nor do they have a clue how to lead this state out of the trouble we are facing. Even in the unlikely event that two-thirds of the states voted for a convention, it would still take three-fourths of the states to pass any amendments. And that isn’t going to happen.